Signed as a free agent on July 4, 2011. Paredes signed with the Winnipeg Blue Bombers on May 16, 2011, attended Blue Bombers training camp and dressed for the team’s second pre-season game. He also attended Winnipeg’s 2010 training camp. (Calgary) Paredes played all 18 regular-season games and achieved a 91.1-per cent success rate on field goals (41 for 45). That made him the first player in CFL history to have four different seasons with a field-goal success rate of at least 90 per cent. Paredes was four-for-four on field goals of at least 50 yards and he was second in the league with an average of 66.1 yards on kickoffs. Paredes booted 41 field goals, 36 converts and two singles for a total of 161 points. Paredes’ 43-yard field goal on the final play of the game lifted the Stamps to a 23-20 win over Edmonton in the Labour Day Classic. He played both post-season games and accounted for 12 points with two field goals and six converts while kicking off nine times for 573 yards. With two field goals in the championship-game win over Ottawa, he improved to a perfect 11-for-11 in his career during Grey Cup play. (Calgary) Paredes played 18 games and made 53 of 58 field goals (for a league-best 91.4-per cent success rate with a long of 48 yards) and 35 of 41 converts. He also had 78 kickoffs for 5,096 yards (for an average of 65.3 yards with a long of 95) and five singles. He kicked for a total of 199 points and also had three special-teams tackles. Paredes had four games with five field goals – against Montreal in Weeks 4 and 15, against BC in Week 9 and and against Saskatchewan in Week 14. With three converts and two singles, he accounted for five points in the Western Final and averaged 70.4 yards on five kickoffs in that game. He was one-for-one on extra points, one-for-one on field goals and had five kickoffs for 258 yards in the Grey Cup. Paredes was a West Division and CFL all-star. (Calgary) Paredes played 18 games and was 56-of-64 on field goals (longest: 52) with three singles. He made 30-of-37 converts and had 81 kickoffs for 5,378 yards (avg: 66.4, longest: 95 yards) and two singles for a total of 203 points. In the Western Final, he was two-for-two on field goals, four-for-four on converts and had six kickoffs for 371 yards (276 net). In the Grey Cup, he was two-for-two on field goals, three-of-four on converts and had five kickoffs for 282 yards (197 net). He had a streak of 32 straight field goals which ended in the Labour Day rematch. He kicked a 52-yard game-winning fielding on Sept. 24 against Winnipeg. Paredes was named a CFL player of the week when he accounted for 17 points in the Stamps’ Week 7 win against the Riders including a five-for-five performance on field goals and a pair of extra points. He was named a CFL player of the month for August when he was perfect on all 17 of his field-goal attempts including two games in which he went five-for-five. The veteran also kicked six extra points and had a total of 57 points during the month. 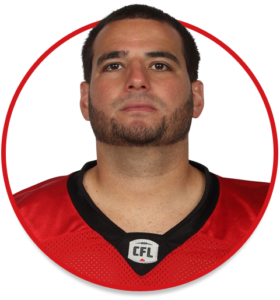 Paredes was the Stamps’ nominee for the CFL’s Most Outstanding Special Teams Player. (Calgary) Paredes played all 18 games and was 41-of-47 on field goals including 13 of 16 from 40 yards out or longer, the longest from 51 yards. He also nailed three game-winning field goals including two, both against Hamilton, on the final play of the game. He had a mid-season streak of 21 consecutive field goals. He added 70 kickoffs for 4,542 yards (avg: 64.9, longest: 95). He also had 26 converts, three singles on missed field goals and four singles on kickoffs. His 152 points and 41 field goals led the West Division. Paredes also played in the Western Semi-Final and was 1/1 on field goals and 2/2 on converts and five kickoffs for 346 yards. In the Western Final he was 5/5 on field goals and had four kickoffs for 237 yards. He is the West nominee for Most Outstanding Special Teams Player and was named a West Division and CFL all-star. (Calgary) Paredes played 18 games and was 33-of-45 on field goals (avg: 31.0, longest: 47) and two singles and has 80 kickoffs for a league-high 5,052 yards and one single (63.2 avg., 95 longest). He also had three special-teams tackles. Paredes played in the Western Final and had seven kickoffs for 440 yards (62.9 avg, 66 longest) and missed a field goal for a single point. He also played in the Grey Cup and was two-for-two on field goals and had three kickoffs for 192 yards (64.0 avg, 65 longest). (Calgary) Paredes played all 18 games and was 54-of-57 on field goals (30.8 avg., longest 52) and had two singles. He also had 81 kickoffs for 5,147 yards (63.5 avg., longest 80). Paredes also played in the Western Final and was two-for-two on field goals and had one kickoff for 67 yards. On July 29, he set a new CFL record for most consecutive field goals passing Paul McCallum’s record of 30; Paredes’ saw his streak end at 39 on Aug. 23 in Toronto. On Oct. 26 he became the third Stamps player to reach 200 points in a season. He earned CFL special teams player of the week when he went five-for-five on field goals and added a convert to account for 16 of the Stamps’ 22 points in a Week 3 victory over the Alouettes. The next week, he was named top special teams player again when he went four-for-four on field goals and added two converts for a total of 14 points in the Stamps’ 38-17 victory over Montreal. Paredes set a new CFL record for field goal efficiency when he finished the season at 94.7%. He was named the CFL’s special teams player of the month for June/July, September and October. Paredes was named a West Division all-star, a CFL all-star, a CFLPA all-star and was named the CFL’s Most Outstanding Special Teams Player. (Calgary) Paredes earned West Division, CFL and CFL Players’ Association all-star honours as he converted 93.0 per cent of his field-goal attempts to set a new franchise record and establish the second-best single-season success rate in CFL history. Paredes was good on 40 of his 43 field-goal tries including his final 18 in a row. He was named the CFL’s special teams player of the month after going a perfect 14-for-14 on field goals in five games during October and November including a game-winner on the final play Nov. 2 in Edmonton. Paredes was 49-for-49 on extra-point conversions finished third in the CFL with 170 total points. He was also among the league leaders with a 63.2-yard average on kickoffs. He was the Stamps’ nominee for Most Outstanding Special Teams Player. In the playoffs, Paredes accounted for 32 points as he was a perfect on eight field-goal attempts and seven extra-point conversions. He was four-for-four in field goals in the Grey Cup game. (Calgary) Paredes joined the Stamps for Week 2 after an injury sidelined Rob Maver. The rookie made an early impression, kicking a 50-yard field goal in his first CFL attempt on July 8 at BC. He went on to make 35 of 45 field goal attempts and finished fifth in the CFL with 158 kicking points. He was perfect on 48 point-after-touchdown conversions. Paredes twice kicked five field goals in a game including an Oct. 14 game against Toronto in which he was perfect in five attempts. He also kicked five field goals on Sept. 9 in Edmonton. He was the team’s kickoff specialist, averaging 60.1 yards per kickoff on 88 attempts for 5,289 yards. Paredes was named the CFL’s top special teams player in Week 2 after helping the Stamps defeat the Lions in BC. He kicked at least 10 points in a game on seven occasions including a season-high 17 points on Sept. 9 against Edmonton and again on Oct. 14 against Toronto. He was three-for-three in field goals and accounted for 10 points in the West Division semifinal against Edmonton. Paredes spent 2007-10 with the Concordia Stingers of the Quebec University Football League. He was among the top three field-goal kickers in Canadian university in each of his last two seasons at Concordia. In 2008, his senior season, he was good on 18 of 22 attempts for an 81.8-per cent success rate, good for third in the nation. In 2007, Paredes led the CIS with a field-goal percentage of 88.2 as he made 15 of 17 attempts and was a Quebec league all-star. During his college career, Paredes was good on 54 of 71 field-goal attempts. Paredes was born in Venezuela but grew up in Pierrefonds, Que. He attended CEGEP at John Abbott College and went to Felix Varela Senior High in Miami, Fla. During his senior year in high school, Paredes was first-team all-Dade County and first-team all-state.